In 2002, when Arcangel created "Data Diaries," if one were set the size of an image or video embedded in a web page larger than it's actual size, the browser would use nearest neighbor interpolation to display the image. In other words – if one were to embed a 50 x 50 px image or video as 100 x 100 px, each pixel would appear to double in size. This default form of nearest neighbor interpolation was exploited to aesthetic ends by many early net artists, including Cory. When Cory made Data Diaries, he rendered the original videos at the dimension of 50 x 25 px - so tiny! 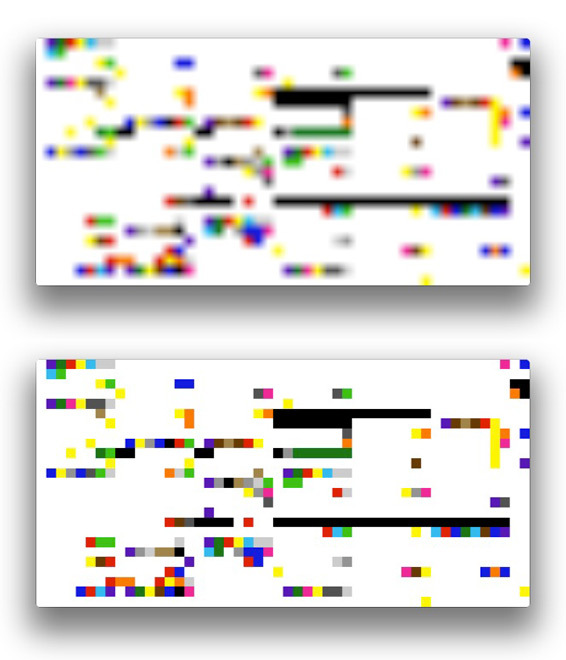 He embedded these videos at dimensions of 500 x 266 px using the default/inherent nearest neighbor interpolation to produce the blocky pixelated color streams. Since 2002, browsers have adopted newer interpolation strategies (either bilinear, or bicubic) for scaling digital images and video. This form of interpolation attempts to smooth or average pixels, rather than simply appearing to enlarge them. This case is a clear example of how the strategically unconventional technical practices of artists can create situations where their work is entirely subverted by something that is far beyond their control. I have created renders of Cory's videos that are exactly 500 x 266 px scaled using video software that allows for nearest neighbor interpolation. Embedding these videos in place of the originals allows for the work to be seen as it originally appeared in 2002. While this is a practical means to aesthetic ends, the elegance of exploiting the inherent quality of a piece software is eliminated. Short of developing an alternative browser that uses nearest neighbor interpolation, it is questionable if this original underlying strategy could be maintained. Why don't you just set up a virtual machine with Windows 2000 and an old version of Quicktime if you want to conserve how it looked like 10 years ago? As you noted yourself, to re-render the video is really pointless, because the video files and the history about how they were created are the piece. The "content" of the video file is not the visuals it produces. Client side emulation is not practical when the main goal is broad access (for everyone - not just the savvy) to a web based archive. That being said, there is a solid argument to provide an access copy as well as the original bitstreams. We should post our g+ conversation. It's true that many of Arcangel's early "dirt style" works don't make sense as emulations, for the same reason that Paik's rewired TV consoles don't: the meaning of the work is bound up with the constraints of the original hardware/software. That said, the beauty of digits is that we can have the original version and the new one as well. In his interview for the show Seeing Double: Emulation As a Preservation Strategy, Arcangel suggested that sometimes he would be willing to add an emulated version that departs from the original technology, just to make a version of the work accessible to more viewers in the future. The only way to know if that's how he feels about Data Diaries is to ask him. That's what the Variable Media Questionnaire is for. Just watched "Data Diaries" on the Turbulence website, where it's been for years ( http://turbulence.org/Works/arcangel/ ) and there is no anti-aliasing - everything is perfectly sharp. I'm using the Quicktime 7.6.9 in Firefox on a PC. Did this change happen with Quicktime 7.7 or is this just a Mac problem? I wouldn't describe anti-aliasing as an "innovation" if it's used by default and changes an image. It's an "enhancement," like digital zoom on a camera, that doesn't always produce the best result. If Data Diaries is looking bad in most browsers Arcangel could think about remaking it (as I did with many of my html-enlarged animated GIFs) but then it would be a new work, as those GIFs are, and would have to be re-evaluated. Otherwise, just let it go. When "letting it go" equals inaction, this often means access for few or none. Take Cory's approach with Doogle. While his decision was to "can" the project – he created a future proof version.